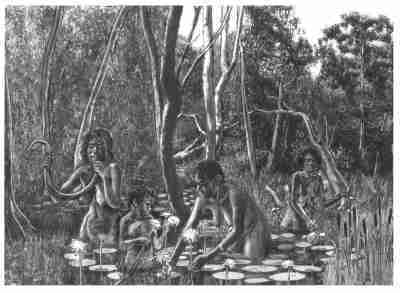 For many aboriginal people plant foods traditionally provided the staples of their diet, and these were usually collected by the women. During the wet season the Gidjingali women and girls collected waterlillies ( Nymphaea spp.) an important source of carbohydrate. The stalks were eaten as one would celery, and the small black seeds were ground into flour to make unleavened cakes. In the dry season, as swamps began to shrink, women dug out the corms of the spike rush, Eleocharis dulcis, known as water chestnut. Long necked turtles and file snakes were also caught for food. A woman would kill a file snake by holding the head in their mouth and pulling down hard to snap its neck. View praise for The Quest for Food.